Well, it seems that if we live long enough, we develop some kind of back pain! Sciatica which is a common diagnosis causes at least 5% of back pain. This pain can be superficial or deep, constant or intermittent. There may be pain that is described as sharp and stabbing and may interfere with sleep. I remember a time recently when I couldn’t lay on a certain side in bed or my right leg would hurt. I was diagnosed with sciatica. Let’s look at the anatomy of the body…isn’t the sciatic nerve located in the back of both legs? So you may ask, why does an injury to your back trigger a response from a nerve in a leg? The two sciatic nerves are the widest and longest nerves in the body. Each nerve is almost as wide as a finger on each side of the body. The sciatic nerve runs from the lower spine, behind the hip joint, down the buttock and back of the knee. There the nerve branches out and down into the foot. When the nerve is pinched, inflamed or damaged in some way, pain may radiate from the lower back all the way along the nerve path to the foot. What are the causes of this pain? In some people, no cause can be detected. In others, the cause may be a herniated or pinched disk, osteoarthritis, or swelling due to an injury. Prolonged inactivity or even long periods of sitting may aggravate the condition. I work in my home on a computer most of the day and I have to remind myself to get up about every 20-30 minutes and walk around or stretch. If not, I have pain that runs down my right leg. What can help relieve this pain? Sometimes the back pain goes away on its own but don’t bank on that happening. 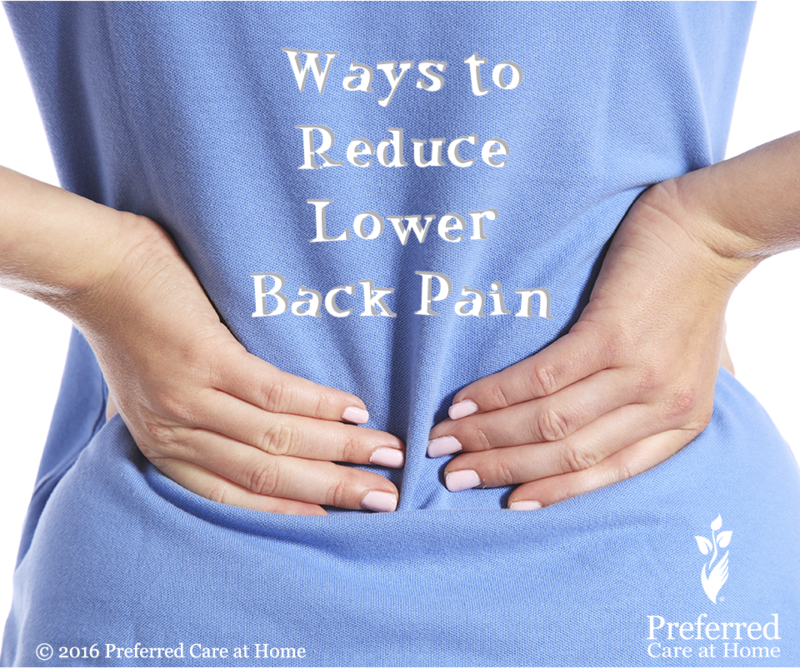 Take some action to reduce your lower back pain. NOTE: Of course none of these suggestions should be utilized without the consult and approval of your physician. Exercise can be your best option! The most effective way to prevent/reduce sciatica and other low back pain is to exercise regularly. Aerobic exercise improves general fitness and strengthens muscles. Specific exercises such as pelvic tilts and abdominal curls help to strengthen and stretch the muscles in the abdomen, buttocks, and back can help stabilize the spine and the ligaments that hold the vertebrae in place. If any of these exercises causes pain, as a general rule, stop the exercise and consult your physician. As a past caregiver, I know that when I was at my strongest and exercising regularly, I was better able to help my patient. Its springtime, get outside in the fresh air, join a walking group and do something for yourself to make you feel better and healthier. Seek help from your local senior services/support services provider for ideas on how you get stronger, healthier, and feel better! Take a step forward, back pain could be a thing of the past!